Getting the car from New Paltz, NY (just outside New York City) to its new home at Quantum in Oklahoma City – on Thanksgiving weekend no less – was a bit of an adventure in itself. But that’s a story for another time. 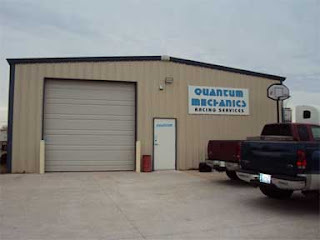 Run by the father/son duo of Wendell and Slade Miller, Quantum Mechanics has been around for decades and always does a great job. 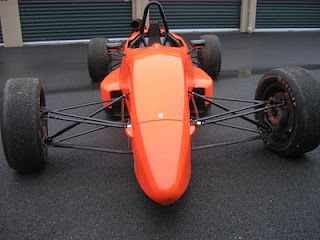 They’ve got experience running everything from SCCA Club Racing programs to Pro Sports 2000 and Pro FF2000, plus Vintage and even a USAC Midget effort(!). The cars they run are competitive, safe and reliable – exactly what you want from a partner/prep shop. We approach racing with a similar mindset, and we both see the long-term potential in developing a strong FF program and building Quantum into a "next step team" for karting graduates. 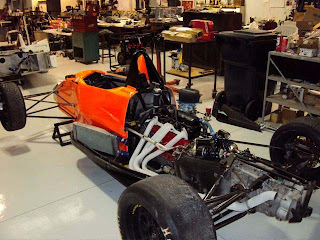 Because that’s one of our goals for this project: establish the team as a multi-car Honda FF effort and started heading some talented kids up the racing ladder towards IndyCars. Here we go again. Different city; different show; completely different ambiance. Today was Opening Day of the PRI Trade Show in Orlando, FL. Compared to SEMA in Las Vegas, the lights are dimmer, the colors are more subdued and there is one major “thing” missing… trade show girls, which apparently are not permitted, although a few have snuck in. We have had our share of passersby. So far we have seen Tomas Scheckter, Buddy Rice, Duncan Dayton, and Scott Goodyear; and Dan Wheldon was here in the Honda Racing/HPD booth signing autographs. Some stopped by to say “Hi” and some checked out our new line of performance parts. Tomas and Buddy were here to compete in the CKI All-Star Karting Classic on Thursday night. The go-karts were still running at 9:30 p.m., so it sounded like they had fun! One other major, very noticeable difference between SEMA and PRI is the lack of giveaway suitcases rolling around the Orange County (FL) Convention Center. Don’t get me wrong, there are definitely giveaways, but it is not as much of a sport here as it was at SEMA. Speaking of giveaways, HPD has added a new giveaway to its lineup this time around. We (and when I say ‘we’, I mean HPD’s Machine Shop) manufactured replica IRL engine spark plugs out of aluminum for use as keychains. Coming from someone who is not into trinkets or chotchkies, they are definitely cool. One show attendee said that they were the coolest giveaways that he has seen in three years. They are definitely a hit. As the doors of the convention center opened this morning, something very interesting occurred. There were display rows on the convention floor that were gridlocked, and others that didn’t have a person in them. Soon, it was discovered that show attendees take a very clear and apparent path. A strategic attack, one might say, in their route through PRI. Maybe it is this the way at all trade shows, but seeing as this is only HPD’s second appearance and we were located in a far corner at the first, this discovery was new to us. This time around, our booth is located in the second row, about 10 or so booths deep (#5525 for those of you attending), so we have a great view of this herd of people. As 6 p.m. rolled around, the crowds VERY slowly diminished. Unlike at SEMA, PRI does not clear out immediately at the end of each show day. Normally, this would be perfectly fine with us. We are happy to sit and chat with anyone who stops by. However, on this particular night there was a free Happy Hour going on in the lobby of the convention center. I am sorry, but after a long day standing in the booth, free appetizers are very appealing. So, free appetizers it was. American Honda Motor Company, Inc., through its racing arm, Honda Performance Development, Inc., is expanding the scope of benefits available to members of its Honda Racing Line program for amateur and entry-level professional racers. American Honda’s service publication support is now available online to Honda Racing Line members 24 hours a day, seven days a week, through ServiceExpress, Honda’s official online reference source for the independent repair community. ServiceExpress will offer Honda Racing Line members the most up-to-date service information, and will make it available at the same time it becomes available to authorized Honda/Acura dealers and repair centers. Launched in July, 2009, the Honda Racing Line is a program targeted at licensed participants in sanctioned amateur and entry-level professional racing. The Honda Racing Line was formed to provide its members with a direct connection to Honda Performance Development and its unparalleled record of success at the highest levels of motorsport. Competitors may register for the Honda Racing Line through HondaRacingLine.com.